The longer an orphan joey has been on it’s own, the more likelihood there could be problems. These are available at the chemist and good to keep on hand (need to be kept in the fridge). Step 2. Silvazine (applied to assist healing) There are other products available that may be more suitable, check with your vet for advice. Alpha Kerri oil, glycerine & water, sorbolene (used to treat dry skin) Do not use baby oil. Thrush is a common problem in orphaned joeys following antibiotic treatment which kills intestinal bacteria. Also joeys that are newly orphaned sometimes present with Thrush. This can be a result of the trauma of being orphaned or not being handled correctly (snug secure pouch) as well as any other stressful situation. First sign is lethargy and a reluctance to drink as the joey’s mouth will be quite sore. Thrush is usually evident in the first week or so of coming into care. The joey may present with white patches in the mouth, (this is often hard to see). In advanced stages this can also be seen around the cloaca. Faeces may become green, loose and smelly. As above the best treatment is Mycostatin Oral Drops or Nilstat Oral Drops, given 3 times a day for 7 days. 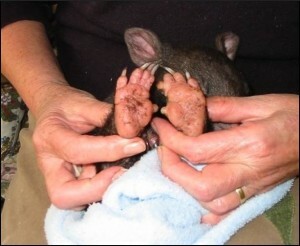 (0.2ml x 3 times a day would be appropriate for a 1 – 2 kg joey). Improvement should be seen after 24 hours (always finish the entire course to avoid a relapse). NOTE – New orphaned joeys 2 kgs and over are often difficult to handle and refuse to take a bottle. Don’t confuse this with Thrush. 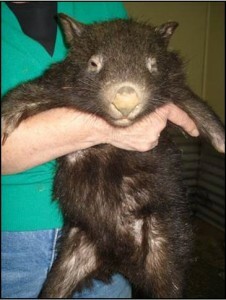 Wombats of this size know they are wombats and don’t want to be handled and can be very difficult to feed. This can go on for quite a few days. The best way to overcome this problem is to offer a little often and they will gradually get used to the new routine. Loose droppings may come in a variety of shades and textures. A general rule is that if your wombat has loose droppings but appears bright, active and retains its appetite, it may be related to a change in their diet or environment and will probably resolve itself quickly. 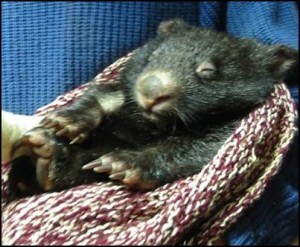 However, if your wombat refuses his bottle, appears lethargic (tired) and feels cold (hypothermic) and is passing offensive liquid – you probably have a major problem needing assistance. Keep the joey quiet and warm and seek veterinary advice. Is it a management problem? (stress, hygiene) or an infection problem (bacterial/viral)? 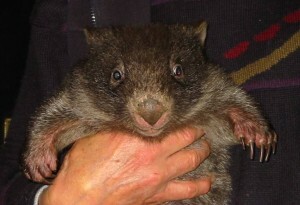 Diarrhoea is one of the most common problems with hand raised wombats. There are many reasons for this, often involving a combination of causes. Is it stress? – being newly orphaned, handled by humans and a change in environment. It can usually be corrected if you follow the guidelines already set out in these notes. However, diarrhoea may also indicate serious fungal or bacterial infections (really bad offensive smell usually indicates infection). Contact your Veterinary Surgeon for advice (make sure you take a fresh, sterile faecal sample with you). 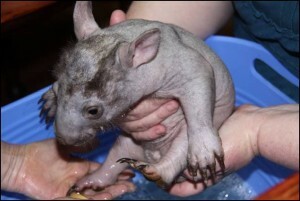 A joey wombat only being fed milk formula usually passes mustard colored paste, this gradually forms into small soft pellets. Once they are eating grass the droppings will be dark colored, formed firm pellets. If diarrhoea persists longer than 12 hours stop all milk formula for the next 24 hours. This will rest the stomach and give it a chance to recover. It is important to make sure the joey has plenty of rehydrating fluids to replace lost fluids caused by the diarrhoea. It doesn’t take long for a baby to get dehydrated. If the diarrhoea stops or slows down considerably after this time then gradually start to reintroduce the milk formula. Start by offering the formula at half strength for the first feed and see if the wombat tolerates this, then slowly reintroduce the formula to full strength. If your joey seems constipated offer a drink of water between feeds. Encourage the joey to exercise (walk around slowly or maybe a short game while you sit on the floor and supervise. A gentle massage (circular motion) on the stomach sometimes gets things moving. If the joey starts to stretch and walk backwards or develops uncontrollable twisting and rolling this is an indication of severe pain. These symptoms can occur with a change in diet or may indicate something more serious. 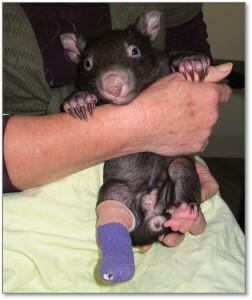 Seek advice from an experienced wombat carer or vet. 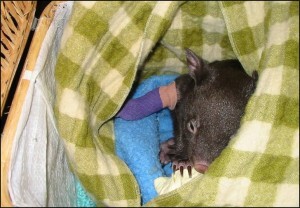 Call The Australian Wildlife Health Centre at Healesville Sanctuary 5957 2829. 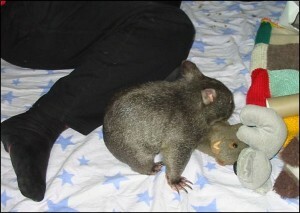 This little wombat was found living under a derelict house. It was malnourished, dehydrated had broken ribs and ringworm. 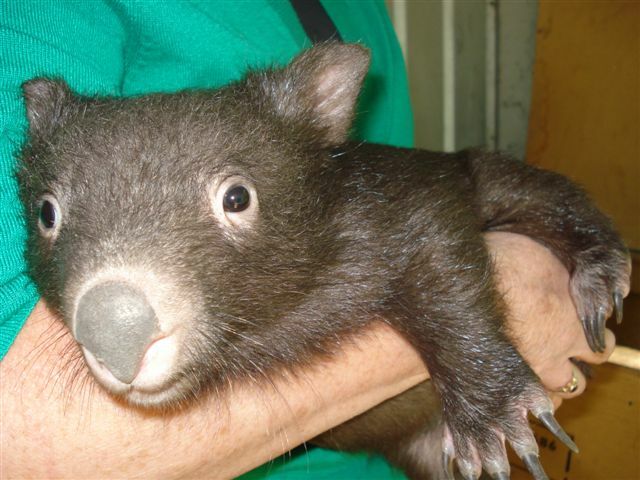 Although there isn’t any treatment for broken ribs it helps if you are aware of the injury and then extra care can be taken when handling the wombat. It should be kept on its own (to avoid further injury and stress) until it is starting to move around and wants to play. This could take a few weeks. 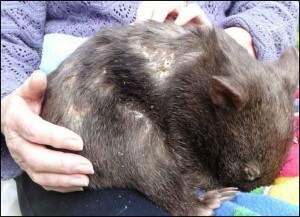 The orphan will present with red, circular, itchy patches on skin and hair loss is usually present. Veterinary treatment is required. 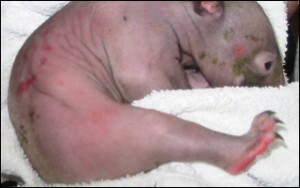 If infected skin is tested under an ultra violet light it may glow green indicating ringworm is present. Lamisil cream (can be used to treat fungal infections) check with your vet for other options. 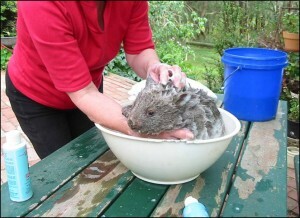 In severe cases bathing the wombat in Malaseb medicated foam every second day will assist in recovery. These need to be dealt with as soon as possible (in the first 24 – 48hours). Remember the trauma of being orphaned will be an ordeal and cause stress and if an injury has also occurred this will cause more stress. Examine the joey sitting on your knee in the security of it’s new pouch. Is there any offensive smell? look for puncture wounds (often hard to see through the fur) open wounds (often around the rump, back of neck and ears). These will need to be cleaned thoroughly as above and antibiotics will be needed to clear up infection. Depending on the severity of the wounds vet assistance may be needed.